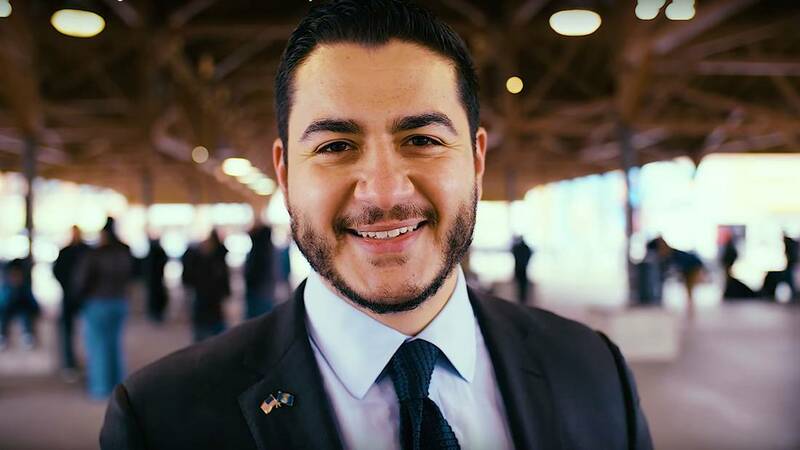 Democratic candidate Abdul El-Sayed is asking a Wayne Court Circuit Court judge to determine he is eligible under the Michigan Constitution to run for governor this November. Democratic candidate Abdul El-Sayed is asking a court to declare him eligible to be on the ballot for Michigan governor. The former Detroit health director on Monday filed a request in Wayne County Circuit Court seeking a declaratory judgment, after Bridge Magazine first reported that his past voting history in New York could put his candidacy afoul of Michigan constitutional requirements for office. A campaign spokesman for the Democrat confirmed the filing but declined further comment. El-Sayed has said he is “100 percent eligible” to be on the ballot, despite a constitutional requirement that candidates for governor be qualified voters of Michigan for four years preceding the election. For the 2018 election, candidates must be registered voters of Michigan since at least Nov. 6, 2014. As Bridge revealed in January, however, El-Sayed was registered to vote in New York as recently as 2015. He was finishing his medical studies and teaching at Columbia University, and voted in the 2012 presidential election New York. After Bridge reported on the issue, the Michigan Democratic Party in February asked El-Sayed to seek a court judgment on the question. “Regrettably, we feel this is the only way to put this matter to rest quickly and without ambiguity,” Michigan Democratic Party Chairman Brandon Dillon said at the time. On Monday night, Dillon issued a statement saying "making sure that this matter is settled sooner rather than later is the best option not only for Abdul’s campaign, but for Democrats as a whole." "We’ve got the wind at our back and want to make sure that after the primary that there are no unnecessary issues standing in our way," Dillon said. Michigan Secretary of State records show El-Sayed has been consistently registered in Michigan since 2003. His registration was placed in what is known as a “cancellation countdown status” in Michigan from 2013 to 2016 because he got a New York driver license and registered to vote. Federal law bars states from cancelling registrations until voters miss two elections. And while it is not illegal to be registered to vote simultaneously in more than one state, elections lawyers have told Bridge that El-Sayed could have trouble proving he was a “qualified voter” in Michigan while he was registered to vote in New York. The filing argued that El-Sayed never relinquished his Michigan residency and owned an apartment in Ann Arbor while he was away in New York. The 32-page filing characterized his registration to vote and drive in New York were "matters of convenience." “El-Sayed maintained an intent to remain a Michigan resident, owning property and maintaining a residence in the state, remaining on the voter and tax rolls in the state, while he and his wife temporarily worked out of state,” the filing stated. The court papers include an affidavit from El-Sayed asserting that he voted in New York in 2012 because he was "unaware that as a student ... I was eligible to obtain an absentee ballot from Michigan." Here is a screenshot of Abdul El Sayed's reasoning behind his request for a ruling on his eligibility to run for governor of Michigan. El-Sayed, who is Muslim, and his supporters have said questions about his eligibility are racist and likened them to “birtherism” – the questions raised by Donald Trump and others about Barack Obama’s birth certificate when he was president. "My hope is that one day anyone can run for office without questions about their gender identity, race, religion, class or sexual orientation. Public service needs all of us," El-Sayed tweeted Monday night. My hope is that one day anyone can run for office without questions about their gender identity, race, religion, class, or sexual orientation. Public service needs all of us. One of the first responses was from a follower who wrote: "Dangit, though, there will always be questions about a candidate's home address." El-Sayed is campaigning as a progressive in a field of four including former Senate Minority Leader Gretchen Whitmer and businessmen Shri Thanedar and Bill Cobbs. El-Sayed has gained national attention for his progressive policies and dynamic speaking skills, but polls have shown he and the others trail Whitmer, who on Monday received the endorsement of the United Auto Workers. It's unclear when a judge would rule on the issue. Such requests typically get quick hearings, but court records indicate the next court date is June 19 before Wayne Ciruit Judge Megan Maher -- seven weeks before the Aug. 7 primary. Secretary of State Ruth Johnson is named as a defendant in the case. Her spokesman, Fred Woodhams, said the office hasn't been served with the suit and can't clarify how the case would proceed. Johnson likely would be defended by lawyers from the office of Attorney General Bill Schuette, who is a Republican candidate for governor, said James Rinck, a Grand Rapids-area lawyer who handles election law cases. That could set up a potential conflict, giving Schuette the opportunity to knock El-Sayed from the ballot before the primary. A Schuette campaign spokesman, John Sellek, declined comment. Rinck said he believes state attorneys will weigh the facts of the case and not be influenced by politics. "I'm not sure it's a conflict because I don't think (Schuette) really has a dog in the hunt," Rinck said. "The outcome is preordained. (El-Sayed) not going to win. The only one who cares if he is on the ballot is El-Sayed." El-Sayed did not apply for an emergency hearing, so it is possible the case could drag on for weeks or months, Rinck said. What's there to rule on? Dr. El_Sayed couldnt be bothered to read what he signed of his own free will. There's more to running for Michigan Governor than promising gullable people free stuff. What does his religion have to do with this story? Please, create change in our media culture and remove references to persons' race, religion, etc. unless that's really relevant to the story. Hi. Thanks for his comment. The only relevance is that El-Sayed and his supporters have raised the issue and claimed the questions about his eligibility are related to his ethnicity and religion. And they're going after Karen Spranger because she's a Christian, I guess. Jeez, religious people just can't catch a break in this state. We don't need another politician who has to ask what the definition of "is" is. It doesn't take a rocket scientist, nor an expenditure of the court's time, to see that if a person is registered to vote in another state in 2015, and is running in Michigan where the law is that the person has to be a qualified voter in MI for 4 years prior to assuming the office that the person is running for, that he/she is just not eligible to run in 2018. He further compounded the ineligibility by re-regeristed in MI in 2016. See you in the governor's race in 2022.